Whenever you are searching for a party bus in Riverview, then there are a number of important points to take into consideration. However, here at Rockstarz Limousine and Party Bus, we strive to provide all of our clients with the most amazing experience ever, no matter what occasion it may be that you and your guests are celebrating. When looking to book your Riverview party bus service, you want to know that the company in question is capable of providing you and your guests with a wonderful time. For us, that is the absolute key to all of this because we always want to make absolutely certain that this turns out to be the best party that you have ever had. To help, we have sought to make the maximum use of the space available to us allowing you to invite even more guests than ever before. However, we don’t stop there. We have also included a number of leather seats allowing you to take a rest while the party goes on around you. 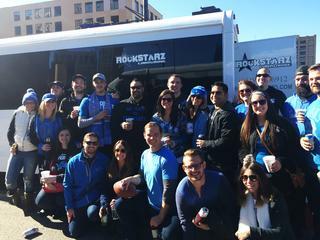 Our Riverview party bus rental is also designed to bring the party right to you. With our top of the range stereo sound system to bang out those songs to the laser light show for added atmosphere; it’s no surprise that it feels as if you are in your own private nightclub on wheels. In the past, people have sought to use our services for a number of different celebrations, and we can handle anything that you need. From a special birthday, to an anniversary, or perhaps even a bachelor or bachelorette party, the reason is not that important just as long as you all have a wonderful time when you are with us. So, if you are looking for that party bus rental in Riverview, then make life easier for yourself by going ahead and contacting us here at Rockstarz Limousine and Party Bus. Alternatively, you can contact us via our website and a member of our team will be in touch to discuss your own individual needs.